2018 seems to be dragging a bit with some sort of slowdown in the PCGS world. We have been waiting on the return of a bulk submission for quite a while and until it comes back we have been backing up other coins for grading and analysis. We sent in another 20 coins for a raw bulk submission and with the other 20 this would move us very close to our 1,000 coin goal. With 953 certified coins and another forty in the bulk submission route we are very close. Our anticipated hardware changes went without a hitch and we now have enough processing power and storage to perhaps last another five or so years. We now have enough power to run all our software plus some new things like a Dino-lite microscope. So onward and upward. VAMs with "Die Gouge in DOL"
Last month we started looking at a group of five VAMs with the designation of "Die Gouge DOL". The five as of January 2018 are VAMs 1B1, 1B2, 18, 43, and 49. ​ All five have a Reverse Die a designation and have the common characteristic of the upward sloping die gouge through DOL in DOLLAR. 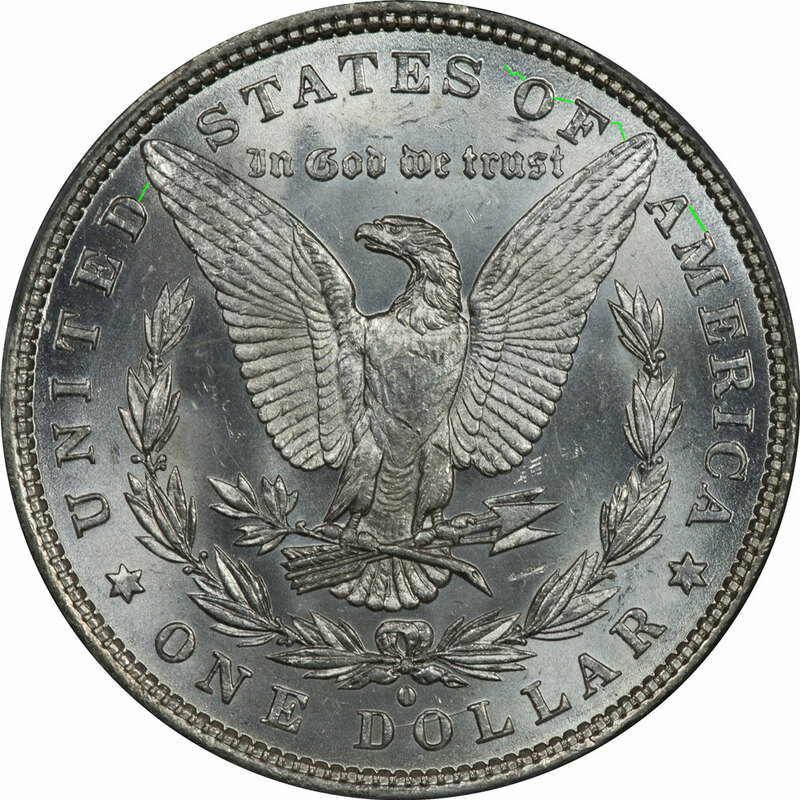 The positioning of the gouge is always consistent, leading one to conclude that this is but one die and the VAM differentiation is solely the obverse pairing. To maintain consistency in reading we are showing the work from last month together with the work from this month. After a month or so pause we returned to reading about coins and ventured off into the world of US Commemoratives. While we have a commemorative or two, we actually have never studied them. One of our interests is the Stone Mountain Commemorative Half Dollar issued in 1925, and this coin is in the first group of classic commemoratives. The good thing is that not much changes in this group so you can read a book that is 75 years old and learn just about as much as from a book written last year. More in line with our work here, but still a side trip, is the story of Joseph Lesher and his decision to make his own dollars. This is a story we had never heard and it does make for interesting reading. Forgotten Colorado Silver by Robert D. Leonard, Jr. is well written and easy to navigate. It has a nice mixture of numismatics, history, and personal story. At only 131 pages it is easy to work through in just a few sessions and we thought worth the time. 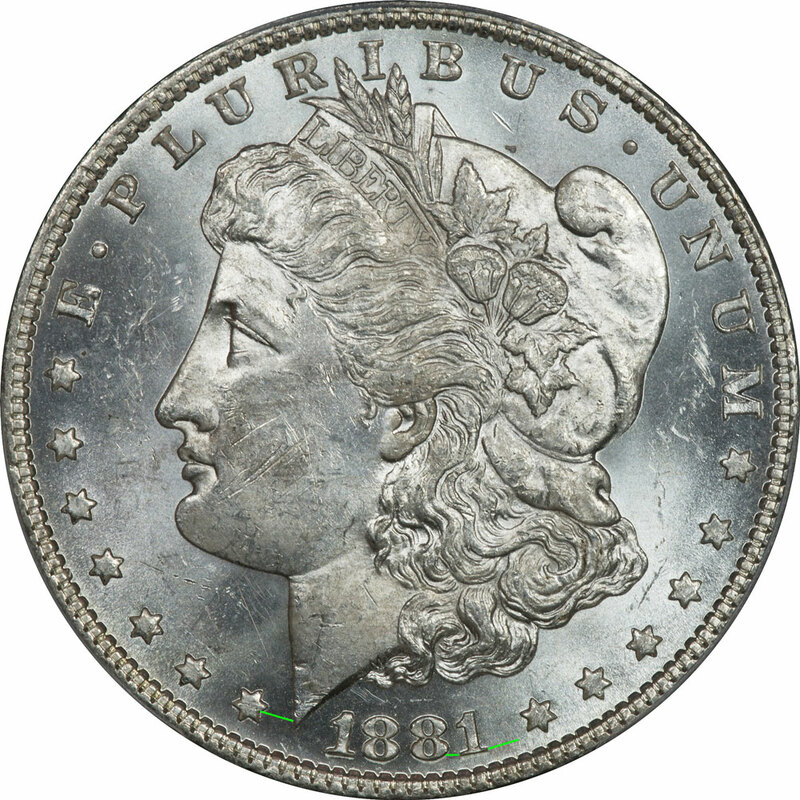 It is one more piece of the silver monetization and de-monetization puzzle that emerged at the turn of the nineteenth century. While the focus on the early part of the book is on the dollars, production, government fights, and other issues around the issue. The later part of the book is dedicated to the lives of the people Lesher made the coins for and the strange twists and turns their lives took along the way. We have eight coins in our inventory designated as VAM 1B1 - Die Gouge in DOL & Denticle Impressions above DOL. This one can be a little confusing because the die can exist with or without the denticle impressions since they wore away quickly. It can also exist with or without a clashed obverse s when paired with Obverse Die 1. This is our most extreme example, but all eight of our coins show the same consistent die cracks shown on this image and stay near the rim. None of them show any signs of significant repolishing. 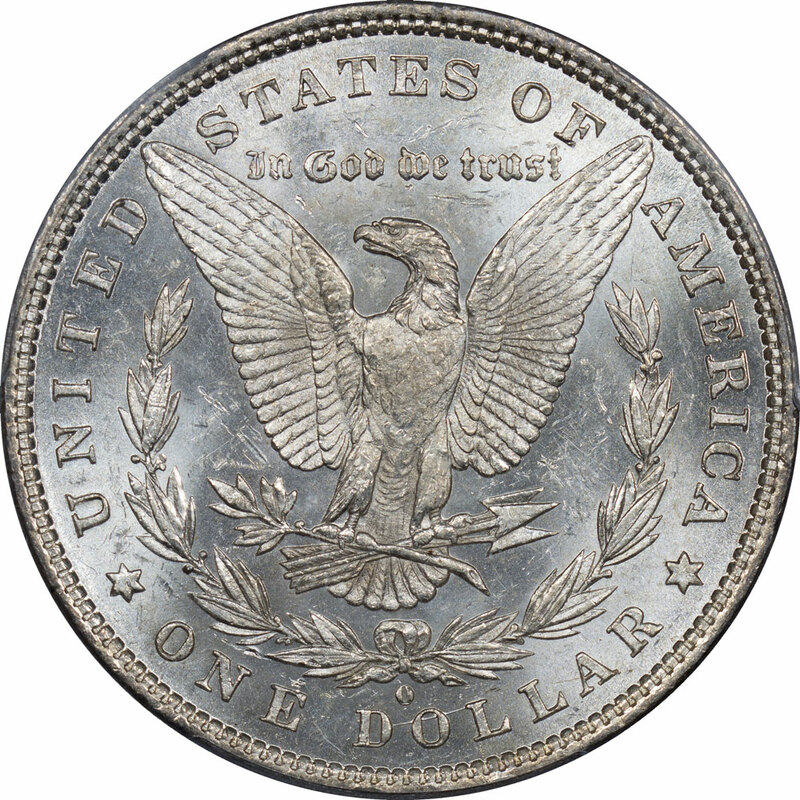 We have twelve examples of VAM 1B2 - Die Gouge in DOLLAR, Clashed Obverse n & st. Like VAM 1B1 this is a marriage of Obverse Die 1 and Reverse Die a, but is double clashed at the neck as a distinguishing characteristic. It appears that the die cracks and polishing of the die are in alignment with VAM 1B1 and that if the die was repolished then it happened after VAM 1B2. As with VAM 1B1, many of the die cracks are just beginning to appear. 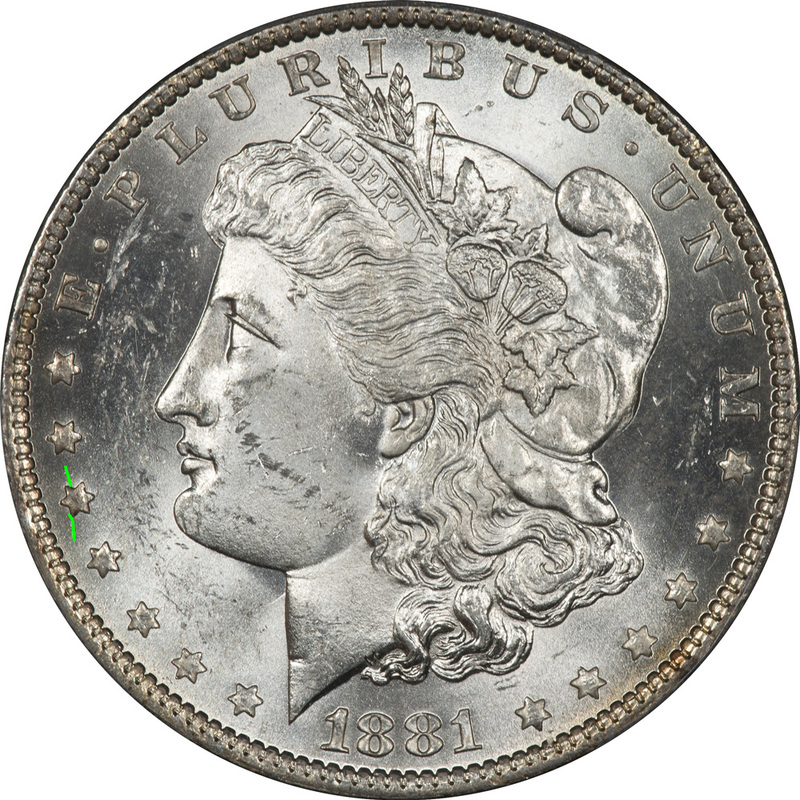 Of particular interest is that the obverse and reverse die cracks align which would indicate that there was no change in the physical dies during the formation of these two VAMs. VAM 18 - Doubled 18, Die Gouge DOL seems to be available but not common. We have five examples that range in grade from Almost Uncirculated 50 to Mint State 62. Some of our best images are from an AU58 coin and we will use it in our illustrations. None of our five examples show any signs of die cracks or breaks, indicating that this VAM probably preceded VAMs 1B1 and 1B2 in use. 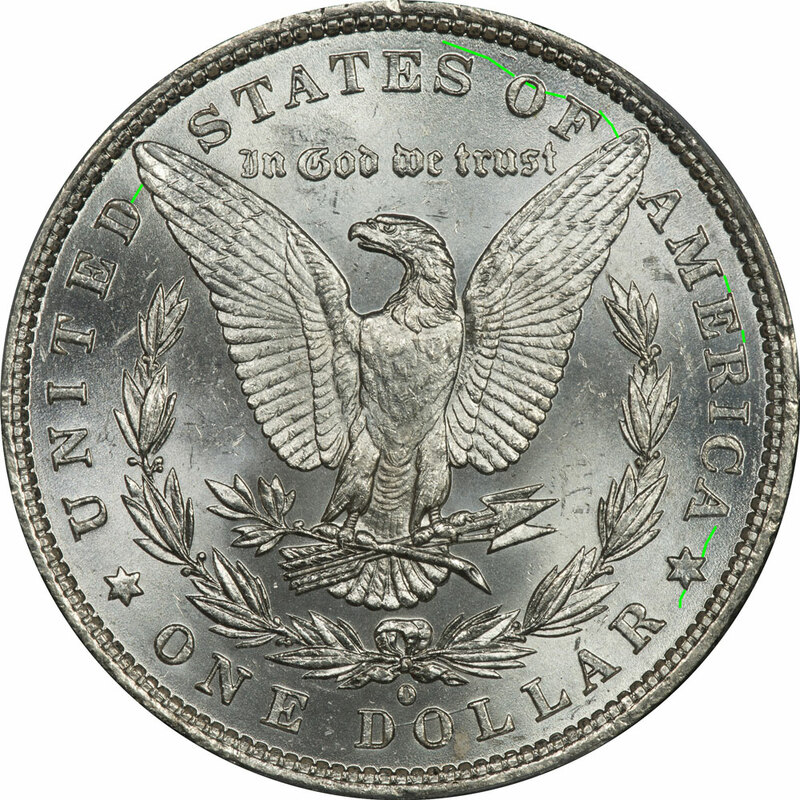 This can also be confirmed because the obverse die used for VAMs 1B1 and 1B2 are further along the polishing sequence than VAM 18. VAM 43 - Doubled Left 8 & Phrygian Cap, Die Gouge DOL seems to be available but somewhat rare and it took us several years to acquire a mere two examples. One of these is an Almost Uncirculated 53 and the other a Mint State 63. VAM 43 is a pairing of Obverse Die 29 and Reverse Die a. The reverse die cracks follow the same pattern as all the others so we are confident of this being the same reverse die. VAM 49 - Doubled 1-1, Die Gouge DOL is also relatively difficult to find and we have only three examples ranging from Extra Fine 45 to Mint State 62. VAM 49 is defined as the pairing of Obverse Die 13 with Reverse Die a. On VAM 49 the reverse die exhibits the greatest deterioration and shows a die crack progression that matches the others, just to a greater extent. We now have the analysis of both the obverse and reverse dies for the five VAMs that feature the Gouge in DOL and there is more to learn by piecing the die analysis together. Issues like how do we validate the die designation beyond the gouge in DOL, which came first, and are the obverse dies the same or different? Are all the reverse dies the same? The gouge through DOL is so distinctive that it is almost assured that the VAMs were all struck from the same reverse die. The die cracks for all five VAMs do in fact line up with the exception of VAM 18 which shows no signs of die cracks, but once again the distinctive die gouge is proof. There are other markers to prove the die linkage in the form of pitting in the wing-neck gap, a unique leaf deterioration in the third left cluster, and some other minor similarities. The above links take you to the matrix page showing the obverse and reverse pairings so you can see both. But clopse examination seems to verify that there is a slight difference than listed on VAMworld for VAMs 1B2 and 18. But the other three VAMs do have different obverse dies. 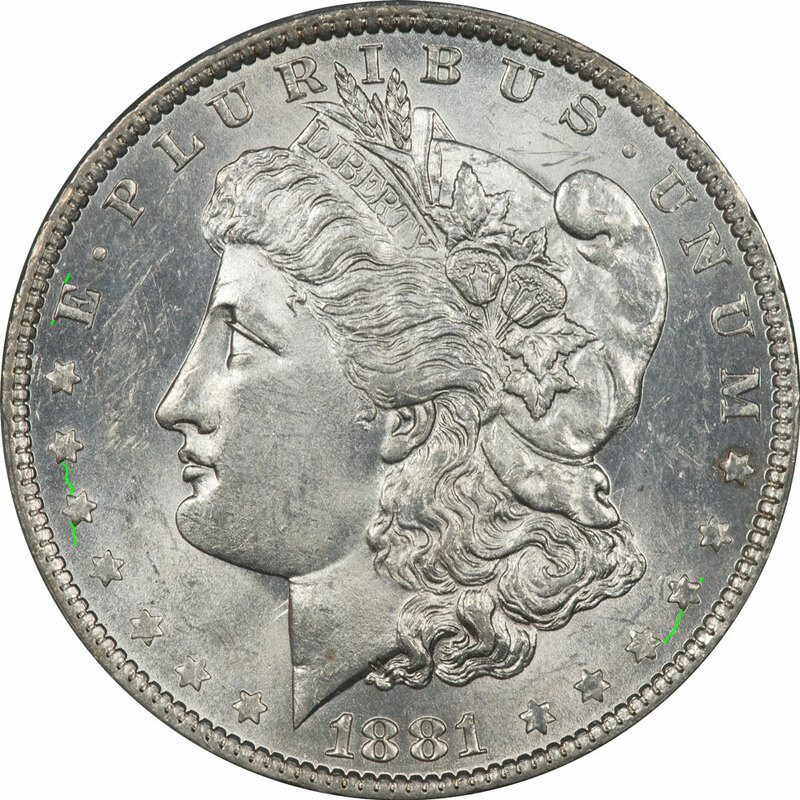 Are the obverse dies correct? This is where things get a little more interesting because on VAMworld we have four different obverse die designations and links to other VAMs outside this set. These are the designations as of 2/28/2018. When we started this discussion we thought it might be pretty much a straightforward confirmation of the die information on these five VAMs. But only the similarity of the reverse dies is obvious and confirmation of those is straightforward. The obverse dies are a different story and needed more work. So we went through all our coins for these five VAMs which includes 1B1-8 coins, 1B2-11 coins, 18-5 coins, 43-2 coins, and 49-3 coins. So a total of 31 coins and we believe a good representative sample. This is what we can conclude from an examination of the coins, some conclusions are easy and some are of course difficult. 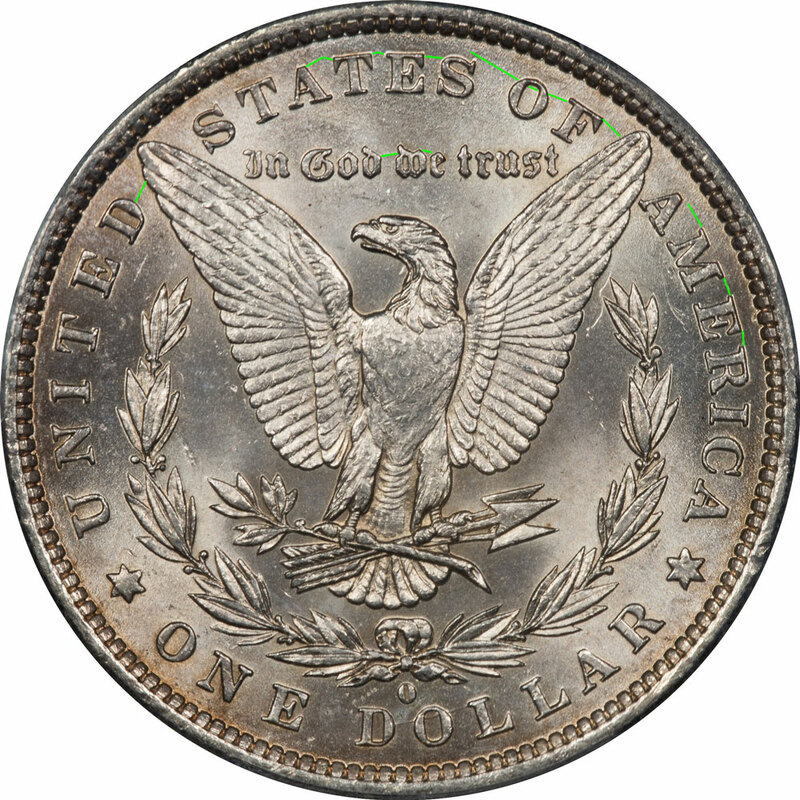 The obverse of VAMs 1B1 and 1B2 are easily identified as the same and have common characteristics of date doubling on the first and last 1s, and occasionally the first 8. The doubling on both 1s is distinctive enough to separate it from the others. They also have the same markings in the ear and lack the "Spike in 8" feature. 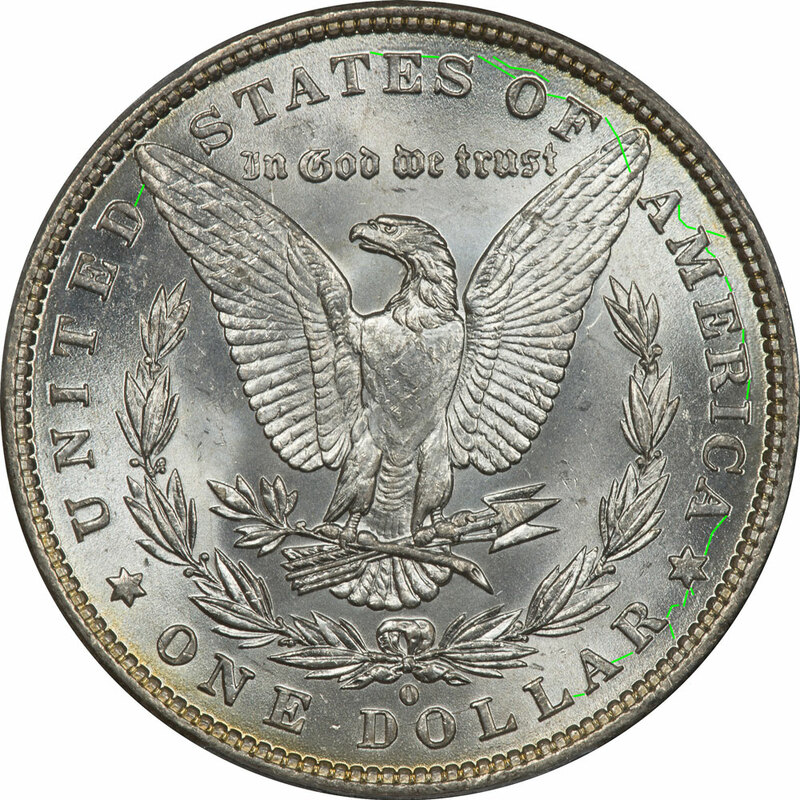 VAM 18 has a similar doubling of the first 1 under the flag, but it is more pronounced and and the notch on the last 1 is missing. VAM 18 also has a "Spike in 8" feature in the first 8, and this feature is missing from VAMs 1B1 and 1B2 or at most so tiny as to be different. For this die to be the same as either 1B1 or 1B2 some serious alteration would have to have been done. VAM 43 may be closely related to VAMs 1B1 and 1B2 with a slight earlobe doubling, and a slightly notched second 1. 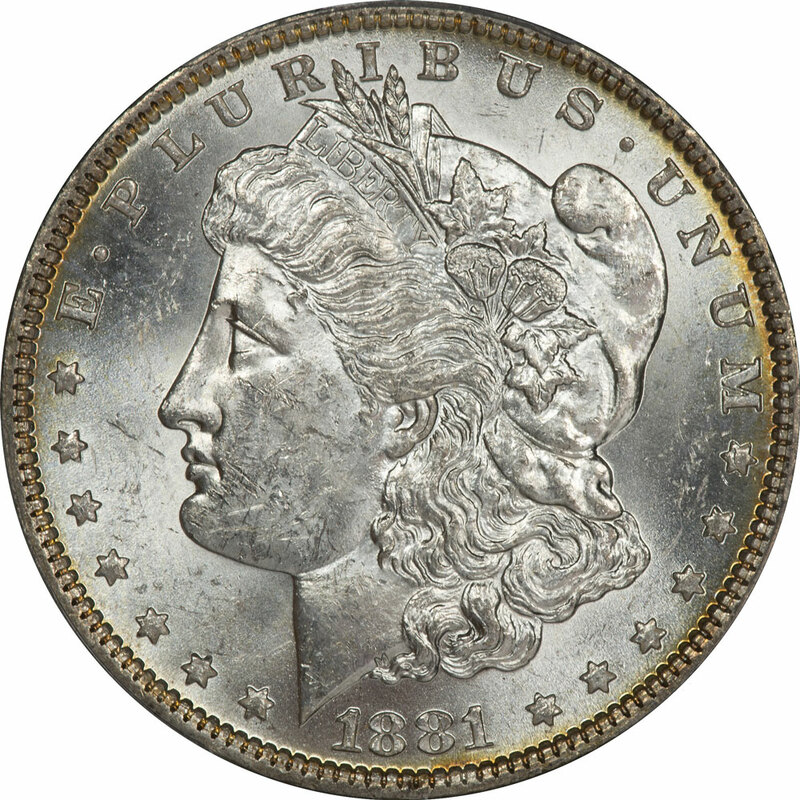 But unless the obverse die for VAM 43 was repolished, they do not seem to be related. And finally on the obverse die of VAM 49 there is a unique diagonal die gouge on the L in LIBERTY's headband that is missing on all the others. It has the same earlobe doubling and similar date doubling, but only a tiny "Spike in 8." So here would be our conclusion having looked at all five obverse dies. The obverse die for VAM 18 is similar, but probably not the same as either 1B1 and 1B2 unless some emission sequence can be identified that would account for the differences. The doubling of the first 1 is definitely different. Time to rest my eyes!